Higher temperatures in the sate increase California’s chances of devastating forest fires. According to a forest ecology professor at Northern Arizona University, Wally Covington, although not entirely to blame for the wildfires in California, in recent decades, climate change has contributed to the increased frequency and severity of wildfires, as higher temperatures have left forests across California dry and easy to catch fire, reported Time. Tree death also boosts the potential of wildfires. Another factor that increases the risk of wildfires throughout the Golden State is tree death, which has resulted from California’s four-year long drought. According to a Forest Service report, over 12 million trees in the state’s forests have died and more are anticipated to die soon. A 20-year “sequence of flammability” is how Covington describes the widespread death of trees. At the start of the sequence, dead pine tree needles dry up and begin a period of “extreme fire danger.” Once the needles fall to the ground, the risk of these needles catching fire remains extremely high but the chance of the fire spreading is less likely. As years pass, the dead trees will fall to the ground and, if they catch fire, they could destabilize the habitat in the area and destroy surrounding soil. Climate change has also been linked to California’s four-year long drought. Research has indicated that the changing climate can be linked to the state’s devastating drought; a drought that, after four long years, shows no sign of letting up and has already cost California billions of dollars and has put thousands of jobs at risk. Scientists are now saying that the drought could add further strength to wildfires, which could affect watersheds, destroy homes, and cost hundreds of millions of dollars to control and extinguish this summer. In fact, the Forest Service estimates that during the season, it will spend over $1 billion and mobilize over 10,000 fires in its forest fire fighting efforts. 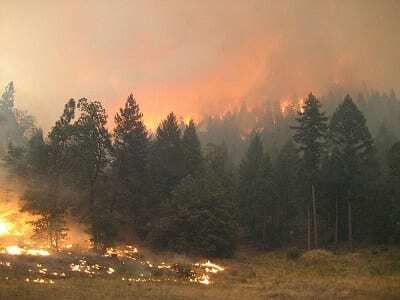 In addition to climate change and dead trees, additional factors that increase the risk of forest fire include hazardous fuels and the presence of a variety of invasive species that can destroy the local environment.